To enhance your viewing, click the play button below for musical accompaniment while you read – America the Beautiful performed by 101 Strings Orchestra. When France shipped their gift of the Statue of Liberty to the US in 1886, it needed assembly. Cost for assembly was estimated to be $100,000 – an enormous sum, but not an impossible goal, if the privileged class wished to assist, which apparently, they did not. The statue would have remained crated in a warehouse indefinitely were it not for the initiative of one Hungarian Immigrant, Joe Pulitzer, publisher of a small local paper New York World. Pulitzer asked the people of the city to assist with the installation. Everyone from grocery clerks to shoeshine boys, to street sweepers came to the rescue. In recognition of their contributions, Pulitzer published the names of every contributor, even if all they could give was a nickel. One young female contributor, Emma Lazarus, wrote a poem for an auction of art/ literary works donated to raise funds for the erection of the statue. Her poem, The New Colossus, closed with the following lines: “Give me your tired, your poor, your huddled masses yearning to breathe free, the wretched refuse of your teeming shore. Send these, the homeless, tempest-tost to me. I lift my lamp beside the golden door!” The statue was not originally intended as a symbol of immigration, but as a monument to international republicanism. After Lazarus’s poem was immortalized in bronze, the idea of Lady Liberty welcoming immigrants became permanent. 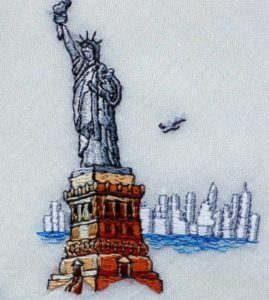 A souvenir hankie immortalizes the skyline of New York in bright, cheerful embroidery. In total, 121,000 people contributed an average of 83 cents to erect this most cherished of American symbols. Because of his fundraising efforts, Pulitzer and his little paper became the paper of the people, and eventually grew into a publishing empire. His impact on the world continues today. One of my favorite anecdotes records Pulitzer locking horns with President Theodore Roosevelt, who demanded the retraction of a story. Pulitzer stood his ground, responding “Mr. Roosevelt is an episode. The press is an institution.” Is it any wonder those recognized for achievement with a Pulitzer Prize feel a certain pride in their individual accomplishments? Reading about those who contributed whatever they could to help rescue Lady Liberty rekindled images of 9/11 for me. It was a time when you could tangibly feel a city, a country, united in a common cause. Photos from that day captured images of heartache and heroism, pathos and patriotism. As powerful and evocative as those images were, for me, the picture I found particularly poignant surfaced a few weeks later. 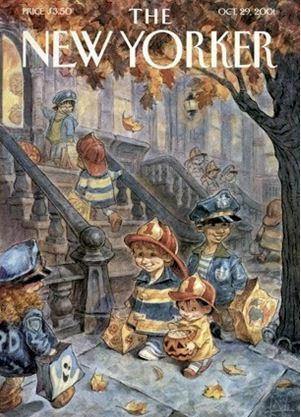 It was a simple painting that graced the October, 29, 2001 cover of The New Yorker magazine. It depicted children immersed in the door to door ritual of trick or treating. And one path we shall never choose, and that is the path of surrender, or submission.